With both sides struggling for form, Jose Mourinho and Antonio Conte will be desperate to avoid defeat on Sunday when Manchester United host Chelsea. Alvaro Morata’s excellent header won Chelsea the return fixture earlier this year, adding his name to an illustrious list of goalscorers in this classic Premier League encounter. 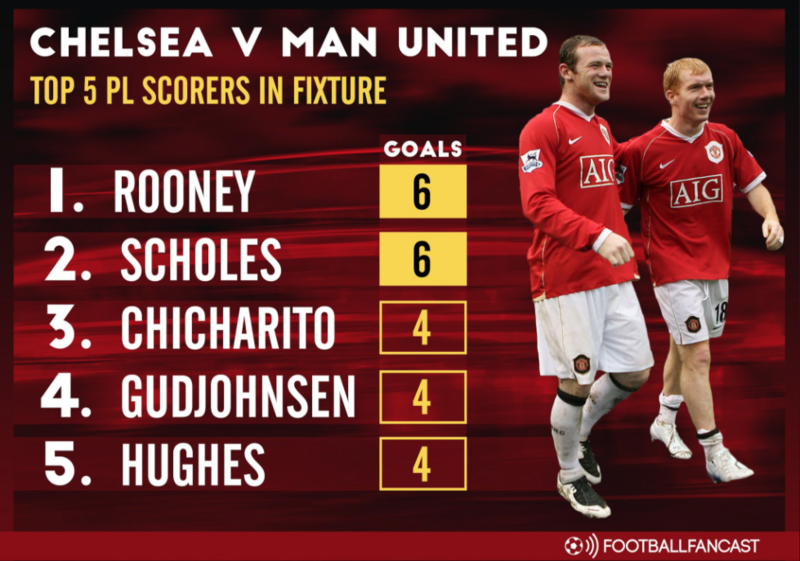 Manchester United players dominate the top scoring charts for the fixture, Wayne Rooney and Paul Scholes sharing the crown with six goals apiece. Scholes scored a fair few screamers in his career, but none sweeter than the equalising half volley against Chelsea in 2000, a vintage Paul Scholes goal. The match ended 3-3, with David Beckham and Jimmy Floyd Hasselbaink also on the scoresheet. Javier Hernandez holds the most impressive strike rate in the fixture, having found the net four times in just seven appearances. Chelsea fans will do well to block the memory of Hernandez’s iconic goal after just 36 seconds in 2011, a match that had huge title implications. The Blues’ only exclusive representative, meanwhile, is Chelsea favourite Eidur Gudjohnsen, with Mark Hughes turning out for both clubs in this fixture. One man who will be looking to add his name to the iconic list of goalscorers for this fixture is Alexis Sanchez, whose opening goal helped Arsenal beat Chelsea in the FA Cup Final last season. Romelu Lukaku will also be hoping to join the top scorer club; the Belgian has an awful record against top six teams but scored one of the best goals of his career against Chelsea back in 2016, a goal that probably still gives Gary Cahill nightmares. A win for either team on Sunday would have massive implications, as it so often does when these two meet. With both managers expected to approach the match cautiously, a single goal could be the difference in securing Champions League qualification, and etch yet another name into this storybook rivalry.